Here is another volume in the series and this one is slightly different. The main three characters of Tozzer, Hornie and Rod return. The main plot is a parody of the TV series 24, with a little bit of the game/ film Hitman. It works well enough but doesn’t have the breadth of the first volume. It is amusing rather than funny in the same way that a Tom & Jerry cartoon is. The artwork still has the same high standard. The format has changed however and the book shares the same dimensions as a postcard being wider than tall. This neither improves nor distracts from the delivery but does mean it won’t line up on your bookshelf with the others. A good try but neither Thumbs Up or Down. Having enjoyed the first volume I eagerly checked out volume two. It was a much larger book and again contained a single storyline. Whilst it was competent and enjoyable to see more of the same, and new, characters it didn’t really introduce anything fresh or novel. I enjoyed reading it but it did not have the originality or unpredictability of the first one. There is a humorous interview at the back and it was interesting to learn that this is a British title (judging by the Bob Monkhouse and Westlife knowledge). The third volume promises a collection of short stories and I think that will serve them better. This goes to prove you can have too much of a good thing. Just missed out on the Thumbs Up. I wasn’t really sure what to expect with its CBeeBies artwork and its Adult Themes warning logo. Like a lot of new material it’s derived from a webcomic which I didn’t know at the time of purchase. 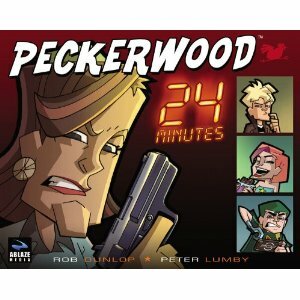 It walks a fine line between the satirical black humour of Warren Ellis and Garth Ennis and the knob and fart gags of things like Viz. 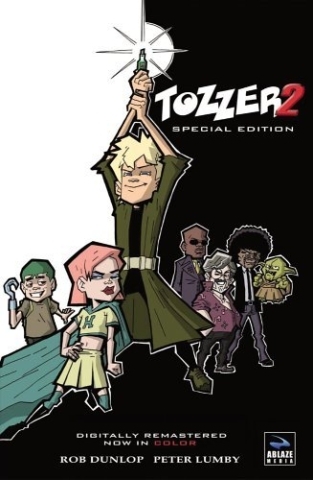 Most of its characters (other than the titular Tozzer) are parodies of celebrities with just enough of the names changed to escape lawsuits. It’s like a Hollywood party in a Ren & Stimpy nightmare. It’s actually very good. It made me chuckle all the way through and there is proper plot and story with classic Scooby Doo ending to test your amateur sleuthing ability. It made me check out the website and order volume two. Thumbs Up from me!